Albuquerque, NM December 12, 2016: Optomec – a leading global supplier of production-grade additive manufacturing systems for 3D printed metals –today announced that the University of Nebraska-Lincoln (UNL) has ordered a LENS 3D Metal Hybrid Controlled Atmosphere System. 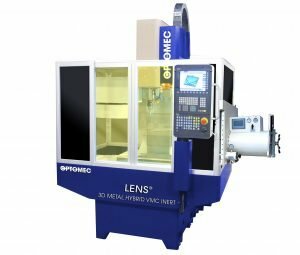 The controlled atmosphere hybrid 3D metal printer is part of the new LENS Machine Tool Series from Optomec, which was announced at the International Machine Tool Show (IMTS) earlier this year. (Click here for more information). The LENS Machine Tool series combines a high-quality CNC vertical mill from Fryer Machine Systems with industry-proven Optomec LENS Print Engine technology to enable low-cost, high-value metal additive and subtractive metal working at a breakthrough price point. UNL will use its Controlled Atmosphere system to advance research in key areas such as heavy machinery, medical devices, and aeronautics. To maximize research potential, UNL needed a machine that could perform both additive and subtractive processes, but also operate in an enclosed environment so that oxygen can be purged from the system to allow for the printing of metals such as titanium and aluminum. The LENS 3D Metal Hybrid Controlled Atmosphere System is the first commercially-available machine of its kind to provide hybrid manufacturing capabilities for reactive metals and aluminum. The LENS 3D Metal Hybrid Controlled Atmosphere System is one of three models that comprise the new LENS Machine Tool Series. Pricing for the new series starts at $249,500 for the LENS 3D Metal Additive System.